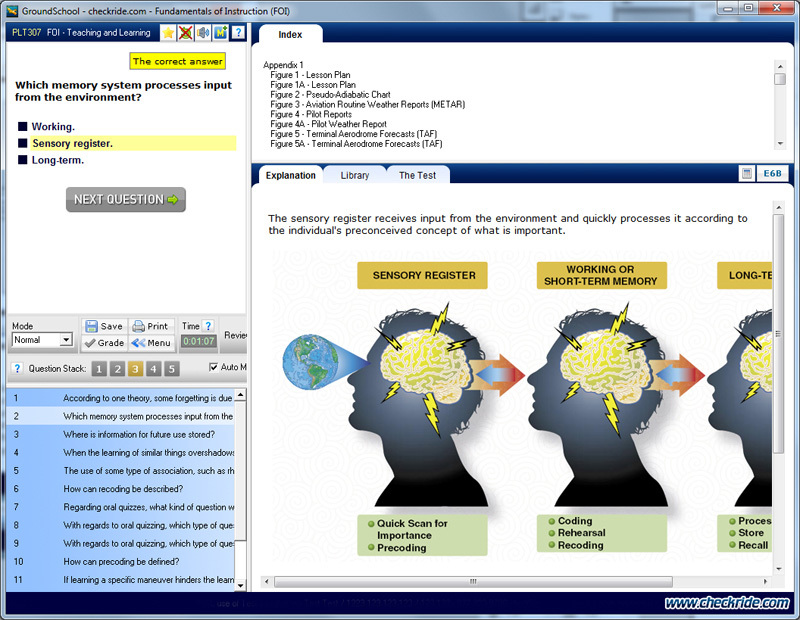 "Thank you for providing such comprehensive and up to date software to prepare me for my FOI written test ... If I would have relied on any other providers' software alone, I would have been unprepared for the test. I did use the [royally-named, royally-expensive competitor's] (outdated) software, and a [amateur-hour] horrible FOI test prep app for the iPad along with Dauntless software in preparing for the test. I credit my success to Dauntless alone. THANKS AGAIN FOR THE FANTASTIC PREPARATION SOFTWARE!" "I studied for just a couple hours a day just under a week and was able to ace my FOI test in 10 min with 100%. Very good descriptions and explainations of answers and why the FAA wants each specific answer. Much better android app than the competition since you can save, and have question stacks. I even understand some of the material better. Thanks a lot Dauntless! Next up is the FIA and AGI, I will let you know the outcome for those as well." The FAA Fundamentals of Instruction knowledge test must be taken by most Flight and Ground Instructor applicants. However, it is only peripherally aviation related. The real focus of this test is the theory and practice of teaching and learning. By making you think about the teaching and learning process, the FAA undoubtedly hopes that you will become a better instructor yourself. 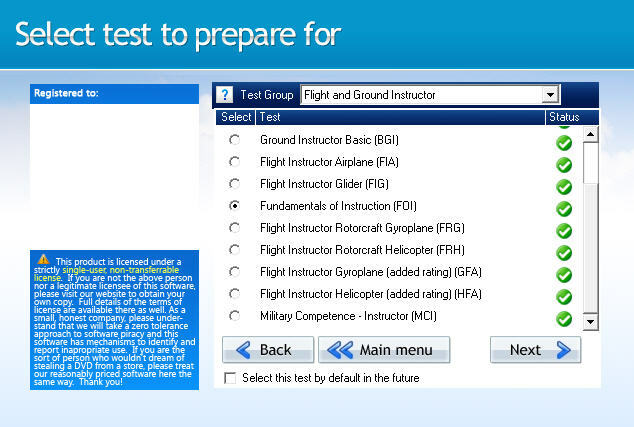 Our GroundSchool software will help you prepare for the FAA Fundamentals of Instruction test in a highly effective way. 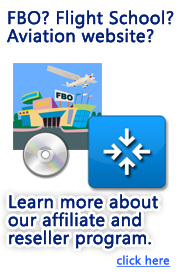 It is 100% what you need to prepare for your FoI written test and features actual FAA questions. Most People Should Get the Combined Flight Instructor and FoI Prep from here. The FoI prep can be purchased as part of GroundSchool Flight and Ground Instructor. For one price, you get both the Fundamentals of Instruction test prep plus a complete prep for your actual flight and ground instructor written test. This is the best solution for most potential flight and ground instructors. Please visit the GroundSchool - Flight and Ground Instructor page if you think this might apply to you. Instrument Flight Instructor Candidate? Somebody who intends to get an INSTRUMENT flight/ground instructor certificate as their INITIAL and ONLY (ever!) flight/ground instructor certificate. The CFI-Instrument (Airplane and Helicopter) test can be studied for using our GroundSchool - Instrument Rating software as the CFI-I questions are part of the FAA IFR, NOT Flight Instructor banks. If you plan on getting your CFI-I as your initial flight instructor certificate, you will likely need to take the FoI written. However, if your instrument will be your first flight/ground instructor certificate but you plan at some point to get your regular "VFR" instructor certificate (CFI/BGI/AGI), then you should look into the combined Flight Instructor / FoI package as you will at some point need to take a "VFR" flight/ground instructor written test as well. Remember, upgrades are always free, so if you buy the software now it will be waiting for you when you're ready to study. Corporate FoI Taker? As it turns out the FoI is a pretty good test and studying for it is generally a worthwhile experience for many, even outside the flight instruction world. Some companies and departments have made it mandatory for a wide variety of people. If you are such a person, maybe our FoI only prep is for you. A small percentage of people, such as those with certain formal degrees in education, are in theory exempted from taking the Fundamentals of Instruction written test. In our experience, however, most people who are in theory exempted end up taking it anyway. Why? First of all, it's often easier to just prepare for and pass the FoI written test than to jump through the paperwork hoops that may be associated with proving your exempt status. More than that, however, is that the FoI is actually quite a good test and a good review of basic teaching/learning theory. And, if you still don't buy that, consider this: even if you are theoretically exempt from the written test, you will not be exempt from knowing FAA Fundamentals of Instruction material during your flight instructor checkride. Remember: initial CFI checkrides are almost always given by an FAA Pilot Examiner. The oral portion of your initial CFI checkride will in all likelihood be quite intense and you will have to know the FoI stuff quite well - you will not be able to bluff your way through it based on your general background in education - the FAA Pilot Examiner will want to hear evidence that you know the FAA FoI take on things. The CFI checkride is among the most often failed and lack of preparedness for the FoI portion of the oral exam undoubtedly makes up a substantial portion of those failures. Your best chance of success is to prepare for and take the Fundamentals of Instruction written test - even if you are theoretically exempt. Unlike books and other materials, our software updates itself using the built-in LiveUpdate feature. You always have the latest and greatest available study material from us at no extra charge. This software costs about the same as what a book does, but is significantly more time efficient. Sure, DVD/Video sets may look pretty, but many find them frustrating, timewise. Our software works on YOUR pace at significantly lesser cost. Yes, you study here using up-to-date, ACTUAL FAA QUESTIONS. Answers and Explanations written by highly experienced flight instructors and professional pilots. All required charts and figures included. Flight Instructor Airplane/Helicopter/Gyroplane and Fundamentals of Instruction. This smaller download includes only FoI. For the most part, you're better off downloading the Flight/Ground Instructor version above, since it includes not only the FoI, but the other Flight Instructor tests as well. However, we provide the FoI-only version here as an option.